How can I boost my wifi range? I want to be able to connect to my wifi network from downstairs in the garage. My apartment is three floors up, and, while the signal is detectable there, it's very weak. How can I extend the range of my wifi router? 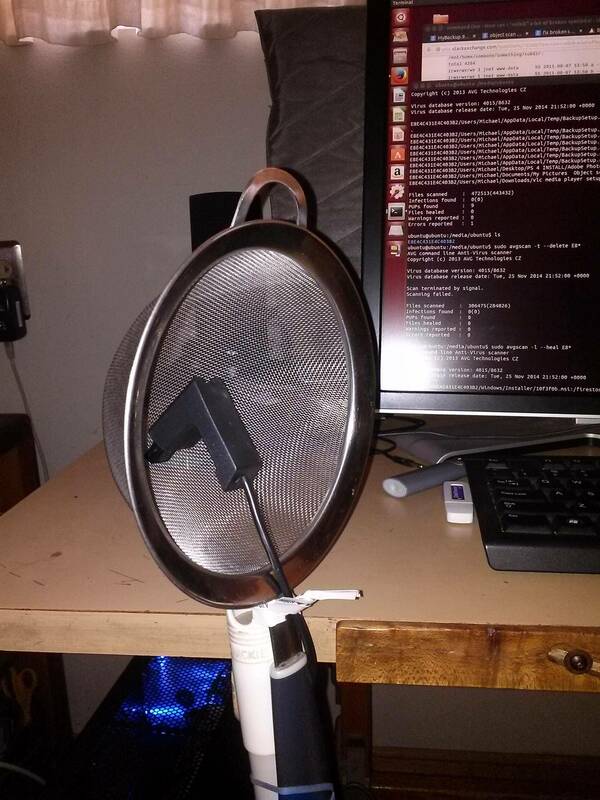 I've had a ton of luck by building a little 'dish' on the receiving end using a mesh colander and a USB WiFi adapter. Obviously, mine is very temporary. A much nicer and more permanent one could be made. Put large furniture along the exterior walls of your home. Signals that don't have to travel through large, cumbersome furniture will make reception better. Minimize mirrors. All metallic surfaces reflect WiFi signals, including the thin metal layer found in most mirrors. As electromagnetic waves, and in this case, wireless signals travel, they interact with objects and the media in which they travel. As they do this the radio signals can be reflected, refracted or diffracted. These interactions cause the radio signals to change direction, and to reach areas which would not be possible if the radio signals travelled in a direct line. Near the center of the house, on a top floor. Radio waves best travel down and laterally. Off the floor, ideally on a wall mount or high shelf. Select a channel that nobody else (or the least number) is using. Away from cordless phones and microwaves, which operate on the same 2.4Ghz frequency. (There are some cordless phones that are WiFi friendly). Away from power cords, computer wires, microwaves, baby monitors, and halogen lamps. These wires and waves can interfere with radio reception. Experts recommend placing wireless network components far from other devices in the house that can cause interference, like cordless phones, microwave ovens, baby monitors or halogen lamps. Of course, people living in crowded urban areas face a greater risk of outside interference from neighbors' wireless networks and devices. Place your router halfway between your access point and your computer for an instant boost. Use aluminum foil. 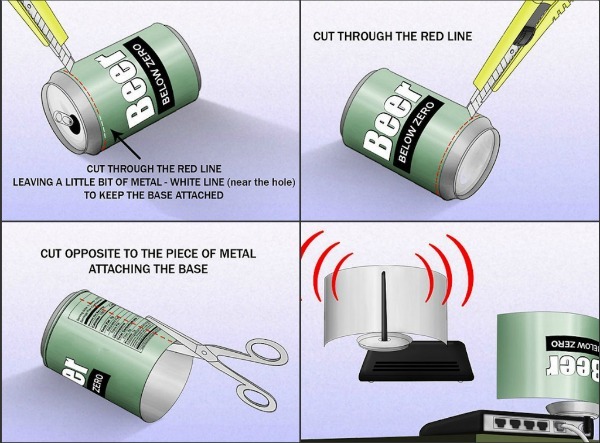 This will reflect the wireless signals from your router. Check your speed/Mbps and keep note of the number that is displayed (I.E. 72.2 Mbps). Tear off a sheet of foil that is around the size of normal printing/copying paper (8.5 x 11 in.). Curve the sheet of foil. If you want to make it easier/quicker, just wrap the sheet around the label area of a 2 liter soda bottle, and hold it there for about 5 seconds. Unwrap it and it should be curved. 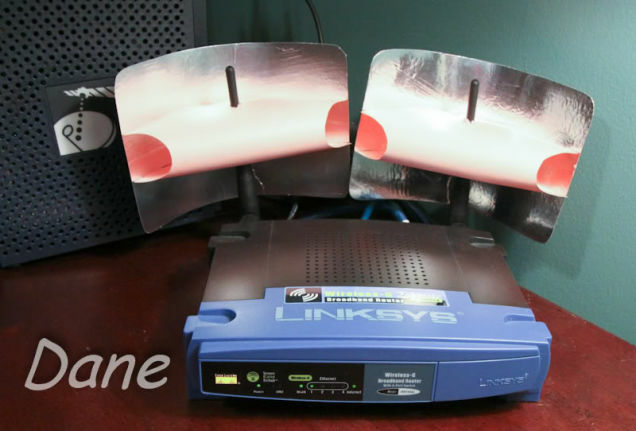 Place the curved sheet of foil on its side (where it's standing up horizontally) behind your router. Check the Mbps/speed. It should be faster than the original speed before you placed the foil behind your router. And other. E.g. 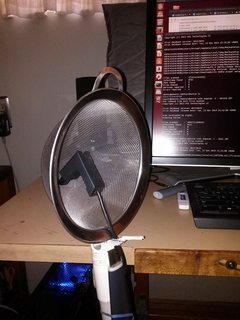 Boost Your Wireless Signal With a Parabolic Reflector, Ez-12 Parabolic Reflector Template (video). Use a WiFi Mapping app (such as NetSpot), so you can diagnose placement and what obstacles are causing your poor signal. 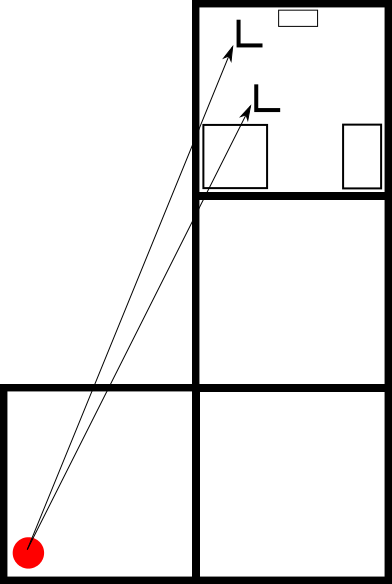 You draw a basic map of your home within the app and then move around your space testing the signal at various corners. This will give you a more detailed look at where exactly and what could cause your issue. Place it in a area that is not crowded. I usually place it on a window sill because that gets better reception. If you want the best signal, you'll need it out in the open, free of any walls and obstructions. Point the antennas vertically, and elevate the router if you can (one reader found that his attic was the perfect spot). Lastly, make sure it's in the center of your house, so you have the best coverage possible throughout your home. Make sure that fewer people are using the Wi-Fi when you plan on connecting, this increases chances of Wi-Fi working better. Why Is Wi-Fi Coverage So Bad in My House, and How Can I Fix It? : This is also very helpful. Use a sheet of aluminum foil behind the antennas. 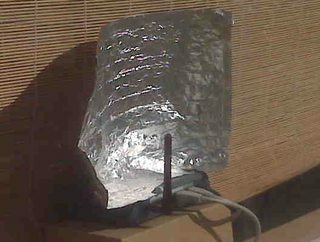 By using foil, you will reflect the signal going away from your devices back toward your devices. However, since your goal is to transverse multiple levels of floors, this won't be very effective. Instead, get a wi-fi repeater. If you have -- or a friend is willing to give you -- an old router, there's a good chance it can be setup as a repeater, perhaps on the second floor. if you're unable to obtain a repeater or place it on the second floor, and the tin foil trick doesn't help, your remaining option is to buy a more powerful router. This means that you must point the side of the antenna towards the direction in which you want to have the best signal. In this case, that would mean setting up the antenna so it's almost parallel to the ground. This will work with any router which has a positionable antenna. Plus, it's free! A note about multiple antennas: place the antennas at 90 degrees from eachother, in a "V" shape, to get the best overall coverage, since each antenna will be covering the other's "dead zone". 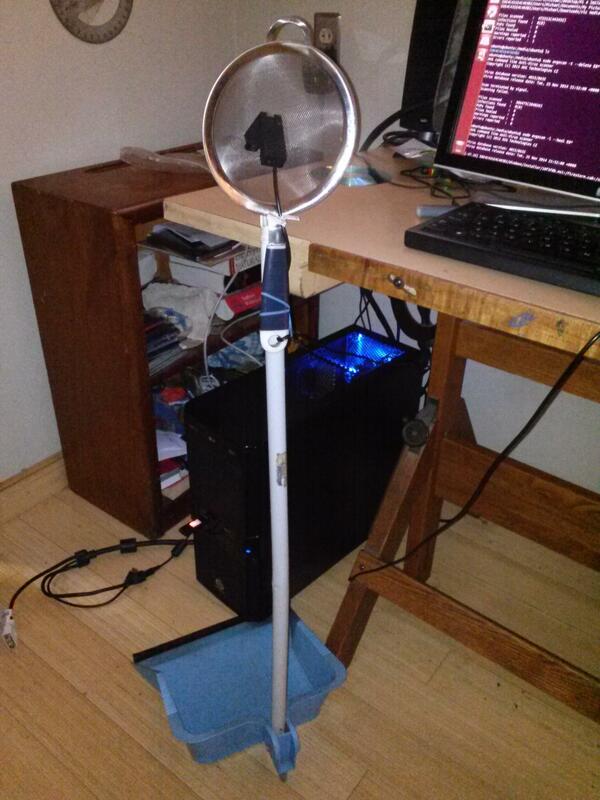 This isn't really a lifehack, but I can say from experience that just buying an antenna can be a great solution. Yes, it's a little pricey, but it works better than most of the things listed here (trust me, I've tried most of them). Alternatively, if you're into making stuff, you can build one very cheaply. why do you have your wi-fi in the garage , why not extend the cable and move it to the 3rd floor or somewhere in between ? I would purchase a signal extender. Many electronic stores have numerous models/options from dirt cheap (poor quality) to better quality hardware. If you don't have foil or if that doesn't work (for the asker or anyone looking here for an answer), I recommend a jug of water. I know from experience that the water amplifies the signal well, and should work in your case. Try a two liter (or 1 gallon) jug filled with plain tap water, and place it next to the router. It may not seem like much, but the water molecules amplify the signal of the Wi-Fi. I currently have this setup to increase the range to an upstairs room in my house, and devices receive Wi-Fi where they didn't before. It's not a life hack, but a power line option is a fantastic alternative to give you a wired connection anywhere in your building. Not the answer you're looking for? Browse other questions tagged technology wifi or ask your own question. How to remove the broken part of the tip inside of the stylus? How to boost wifi signal range without touching the antenna or router using reflectors, etc?